An NMEA 0183 multiplexer with 5 inputs and two outputs compatible with PC serial ports, preconfigured for use with an AIS system. 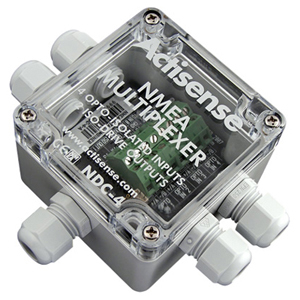 The Actisense NDC-4 NMEA Data Multiplexer / Combiner allows up to five NMEA (National Marine Electronics Association) inputs to be combined into one output. The NDC-4 has two ISO-Drive outputs which are fully compatible with all standards: NMEA 0183 (RS422), RS485 and PC RS232 ports. The NDC-4-USB model has an additional USB bi-directional port that allows a copy of the data on the second ISO-Drive output to be sent to a virtual serial port on a PC, while also receiving data (waypoint data for example) from the PC through the same virtual port. This option disables the opto input reserved for the PC connection, reducing the number of inputs the NDC-4-USB has to 4. New feature: The autoswitching feature of the NSW-1 has now been added to the NDC-4, making it the single most feature rich Multiplexer available in the marine market. The NDC-4 can either operate in 'Combine mode' as before, or the new 'Autoswitch mode' to behave like the original Actisense NSW-1 Autoswitch product. 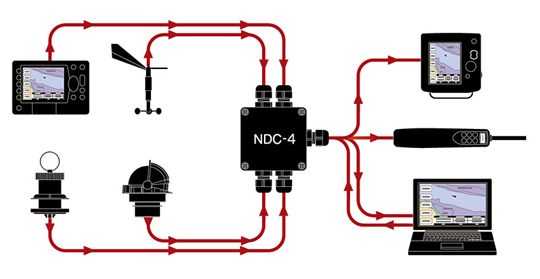 The NDC-4 Data Multiplexer contains intelligent software that manages the multiplexing operation, allowing every input to have a chance of its data reaching the combined NMEA output. Tested up to and beyond a combined 400% loading of the four inputs. 5 Opto-isolated NMEA 0183 data inputs Full galvanic Opto-isolated differential inputs that fully comply with the NMEA 0183 standard specification. This allows the input to work correctly with long cable runs, and/or in a noisy environment. This also allows the NDC-4 to offer up to 2500v of common mode voltage difference (between its input and outputs). This will prevent any ground loop damage occurring. Inputs 0-3 have independently selectable baud rates of 4800 to 57600 baud; Input 4 is fixed at 4800 baud. (When the USB connection is in use, the number of NMEA opto inputs is reduced to 4). 2 ISO-Drive flexible outputs The ISO-Drive outputs are fully compatible with the RS422 (NMEA 0183), RS485 and RS232 connections on the NMEA listening device(s) the NDC-4 supplies data to, and offers total galvanic isolation of up to 1500v between the output and ground. The full-differential output ensures better quality communications and lower noise emissions on unshielded twisted pair cabling. Outputs 0 & 1 have independently selectable baud rates of 4800 to 115200 baud. NMEA PC (USB / ISO-Drive) data input Enables PC software (e.g. chart plotter) to add NMEA sentences to the combined NMEA data output. Perfect for PC chart plotter controlled course steering via the NMEA network. NMEA and PC (USB / ISO-Drive) outputs Allows any NMEA device and PC to read the combined NMEA data output. Furthermore, special NMEA codes are used to label each NMEA sentence - allowing the NMEA device or PC to determine where all the NMEA information originated from. Powerful processor An ARM 32-bit microcontroller capable of 40 million instructions per second, and very large NMEA data buffers to allow smoothing of short-term peaks in the NMEA data flow. Flash upgradeable The hardware's firmware (software) can be easily upgraded as and when necessary. Combine mode: Intelligent software Filters the valid data from all active inputs, using the configured Inclusion lists, and then combines the remaining data using a simple priority system. Highest priority input (1) has the best chance of its data being added to the output combined NMEA data, and input 4 the lowest chance. This advanced user controlled system only operates as and when it becomes necessary to reduce the NMEA data outputted (triggered by very high loading of the combined NMEA output). The ISO-Drive and / or USB output will always contain all of the NMEA data (due to its higher Baud rate and bandwidth). Autoswitch mode: Intelligent software Determines the highest priority device with valid data, based on one of three reasons - a failure to send any NMEA data, an invalid NMEA sentence checksum, or if the validity flag(s) contained within the NMEA sentence indicate that this data is not valid and should only be used with caution (for GPS and Depth data). The chosen input's data will be resent out the two ISO-Drive outputs (and USB if available), allowing two different Baud rates to be used (typically 38400 Baud and 4800 Baud). 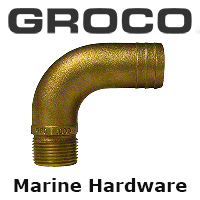 Very low current consumption Ideal for small vessels with small batteries. Diagnostic tri-colour LED Indicates current operation mode, volume of data being multiplexed, or if a hardware fault has been detected. IP66/IP68 case and gland design A very robust polycarbonate case with a high waterproof certification. The small case size is ideal for space restrictive applications. High quality angled screw terminals The 'moving cage' type terminals make cable installation a simple and quick operation.